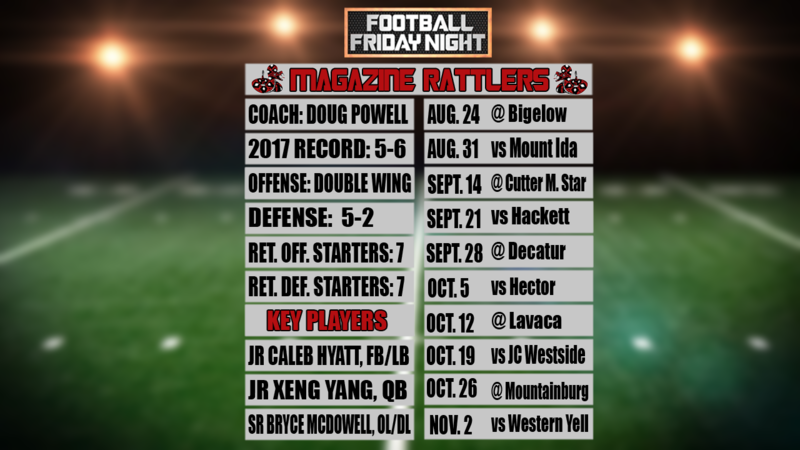 MAGAZINE (KFSM) – A year after getting a taste of the 2A playoffs, Magazine is ready for more in 2018. The Rattlers return 14 starters, seven on each of the ball, and that alone would be cause for optimism but this team said there’s even more. Experience goes a long way in high school football and Magazine certainly has that after winning five games a season ago but now they have to try to close the gap between themselves and the top of the 2A-4. Magazine went 3-4 in their conference but all four losses came by at least 19 points. Magazine opens the season on Aug. 24 at Bigelow.